Naviga per Roma per vedere le sue attrazioni antiche e barocche durante un tour in Segway. Con la possibilità di coprire più terreno di un tour a piedi ma di essere ancora fuori, un Segway è il modo migliore per ammirare le famose attrazioni di Roma come Piazza di Spagna, Fontana di Trevi e il Colosseo. Visita piazze animate come Piazza Navona e impara a conoscere la ricca storia di Roma dai commenti audio. Il pranzo con vino è incluso. Limitato a otto persone, questo tour per piccoli gruppi offre un'esperienza più personalizzata. Vedi quasi tutta Roma in un giorno e vinci con la tua pausa pranzo. La tua avventura Segway inizia incontrando il tuo tour leader nel centro di Roma, dove riceverai un iPod con riepiloghi audiovisivi che forniscono informazioni su ogni tappa. Dopo un'introduzione e una sessione di prove pratiche per familiarizzare con il tuo Segway elettrico a 2 ruote, decolla lungo le strade storiche di Roma per la tua esplorazione che riprende i punti di riferimento antichi e barocchi della città. Inizia con l'antica Roma. Segui il tuo capo, sali sul Capitoline Hill, uno dei sette colli di Roma, e poi oltrepassa il Foro Romano, ammirando le sue rovine mentre ascolti la sua storia dalla tua narrazione audio. Scivola sul Palatino e sul Circo Massimo per raggiungere il Colosseo, dove ti fermerai per una foto del vasto anfiteatro. Ammira Piazza dei Cavalieri di Malta per ammirare una vista sulla Basilica di San Pietro e fare una pausa nel Giardino delle Rose prima di andare a pranzo in un ristorante locale. Fai il pieno di piatti italiani come pizza e bruschetta, accompagnati da un bicchiere di vino, caffè espresso e acqua minerale (vedi l'itinerario per un menu di esempio). Dopo pranzo, continua il tuo tour con i capolavori barocchi della Città Eterna. Mentre attraversi il centro storico, attraversa Piazza di Spagna, la Chiesa di Sant'Ignazio, Campo de 'Fiori e Piazza Navona, sede della Fontana dei Quattro Fiumi del Bernini. Visita un belvedere per ammirare St Peter's e fermati vicino alla Fontana di Trevi, dove la leggenda dice che se gettassi una moneta nell'acqua, tornerai a Roma. Il tuo tour termina quando torni al punto di partenza. Nota: l'ordine dei luoghi suggeriti nella descrizione del tour è soggetto a modifiche il giorno del tour. We booked the 10 hour Segway tour that included a 3.5 hour lunch. Salima was our morning guide and she was very, very good. Excellent English, good guide, just enough attention, but not overbearing. If all we did was the morning tour I would have rated our trip 5 stars. But, we didn't do just a morning tour, so I must downgrade our rating. After the morning tour we were taken to a restaurant where we were obviously not the priority. I don't directly blame the tour company, however, they chose the restaurant, so they bear some responsibility. Took forever for someone to wait on us, then the food tasted like leftovers. One of the worst meals we had during our 2 weeks in Italy. However, the real disappointment was our afternoon guide. His English was certainly better than my Italian, but that is not saying much. His explanations were choppy and short. He was also FAR too concerned with our boarding our Segways. I felt like I was being babysat as he would hold the machine everytime we stopped or started. Kinda frustrating after riding all morning. Probably because the explanations were so short, we finished the afternoon session with an hour left. We really felt short-changed with that loss of an hour. The Segways are awesome and we would have enjoyed getting full value for our payment. One last comment There was a lot of 'dead time' between destinations. Having a guide describing the areas we were travelling thruvia a headset would have made this a really great tour. Segways are a great way to see a lot of the city in a short time. However, our tour could have been handled so much better. The previous night we also took a Night time Segway tour from this company. During the two part daytime tour we visited a couple of the same sites but was a totally different experience during the day. The whole day tour is broken up into three parts - a morning segway tour and an afternoon segway tour with lunch in-between at a local restaurant lunch was excellent - I highly recommend the lasagna. Each of our tours had a different Segway Guide. This allowed us to hear some different perspectives. Our morning tour consisted of a group of 8 and our afternoon was supposed to have 5 but the other two cancelled that morning so we basically had our own private tour which was wonderful. 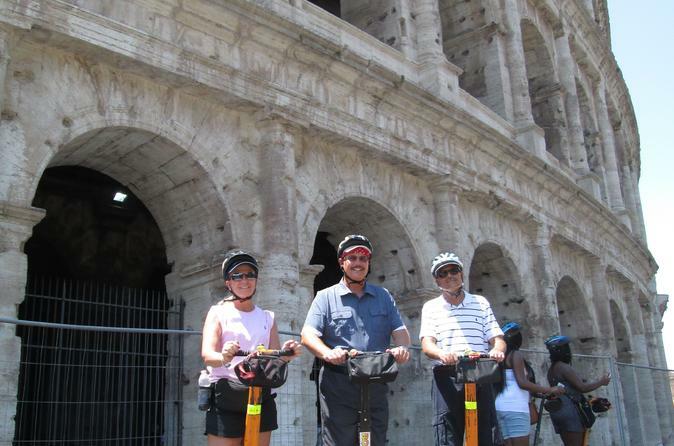 All tour guides make sure that each of the passengers feel safe on their segway machines. 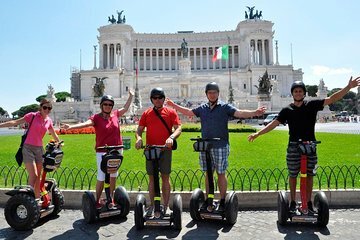 Taking a segway tour of Rome is the ONLY way to see everything the city has to offer. Zipping past the other tours in their walking groups really made us appreciate how much nicer and efficient this way of touring really is to see Rome. It was a hot and crowded day in Rome, but we still enjoyed both parts of this Segway adventure. In the morning, Bruno showed us all kinds of sights. I think our favorite stops on the morning tour were the market in Campo del Fiori and tossing our coins in the Trevi Fountain. Bruno did an awesome job making sure that everyone was comfortable on the Segways and then describing many of our stops. There were 4 in the group, so his bilingual French / English explanations were detailed and informative. In addition, he pulled out Ipads at some of the stops for even more information. Flavio led our afternoon tour - 5 of us with German and English descriptions. He was a lot of fun to follow on a Segway. Our favorite stops on the afternoon tour Ancient Rome were the amazing overlooks - loved the one in the orange grove overlooking the dome of St. Peter's which got smaller the closer you got to it! It's a bit late to write my review but....never too late! I joint this super fun and exciting Segway Tour on 4th of May. Before the tour, I just wondered if I could visited all those famous ancient attractions mentioned in the itinerary within several hours, but that's true and all the way riding on the Segway was so cool!! I forgot the name of our tour leader in the morning session but just remembered this handsome young guy is tall and gentle, and in the afternoon, we visited the best places of Rome with Flavio I hope my memory is correct! I wanted to thank them again and tell them that this Happy Tour is the most unforgettable memory in Rome to me. This is the only way to tour Rome. We covered over 20 miles during the tour and had a wonderful lunch. No way to walk 20 miles in one day and you have very knowledgeable guides telling you about all the sites. I reccomend the nighttime tour in the heat of Summer. A lovely trip unfortunately very rainy day and this is not the best way to tour on a rainy day, but a great experience! Great tour! Highly recommend it. Our guides had great personalities and made the tour fun!! good tour, tough to get through some of the crowds though. It was good, but not great. Everything was so rushed that we didnt spend anytime. It was more of a drive by places. We stopped minimally at CERTAIN places to take photos. Tour guide was great, but the set up was poor. Many of the other people, including myself left the tour at the half way mark so we could better check out everything. I recommend finding something else.